If you’re looking for a cool present for someone, some interesting home decor, or a small accessory for your desk, then check out the Kikkerland Magnetic Hourglass! This unique hour glass creates beautiful patterns and stalagmites as the sand slowly trickles down. 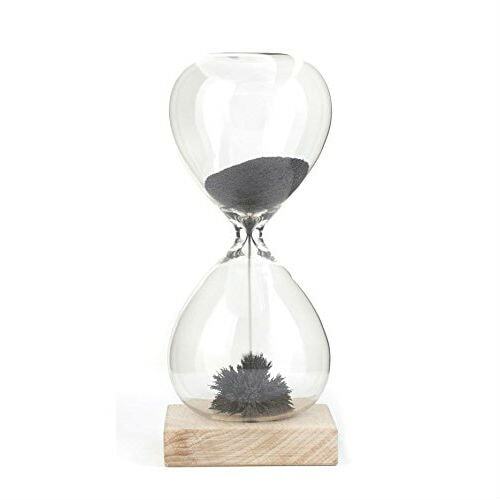 At about 6.5 inches tall and only less than 3 inches wide, it is easy to find a spot for this magnetic hourglass. The sand inside is ferrous sand, a sand that has a heavy concentration of iron in it. Combine this sand with the hidden magnet, and voila! It creates beautiful stalagmites that you can watch and be amazed by. It only takes 60 seconds for all the sand to fall to the bottom and you can watch, enjoy, and relax while it slowly falls. If you’re working and you need a break from the computer screen you can just flip your hourglass over and take a 60 second break to watch as the ferrous sand creates amazing patterns. The Kikkerland Magnetic Hourglass also comes with a small wooden base that you can set your hourglass on if you’d like to. If you’re looking for a birthday present, Christmas present, a housewarming present or you’re just looking for something decorative and unique for your home or office, the magnetic hourglass is perfect.